(Nanowerk News) Graphene, a single atomic layer of graphite with a carbon-layered structure, has been drawing much attention because of its abundant electronic properties and the possibilities of application due to its unique electronic structure. Andre Geim and Konstantin Novoselov extracted single-atom-thick crystallites from bulk graphite in 2004 for the first time. This results earned them the Nobel Prize in physics 2010. In addition, this group also clarified that electron partitioning did not take place under the absence of the p-n junction even in the QH regime (Nature Communications, "Edge mixing dynamics in graphene p–n junctions in the quantum Hall regime"). It is expected that this group's achievement will lead to the clarification of the electron partition process in the graphene p-n junction in the QH regime because of its spin freedom and valley freedom and the realization of electron interference devices using the graphene p-n junction in the QH regime. Kensuke Kobayashi (Professor, Graduate School of Science, Osaka University) and Sadashige Matsuo (Assistant Professor, Graduate School of Engineering, The University of Tokyo), in cooperation with research groups led by Teruo Ono (Professor, Institute for Chemical Research, Kyoto University) and Kazuhito Tsukagoshi (Research Fellow, International Center for Materials Nanoarchitectonics, National Institute for Materials Science), produced graphene samples capable of forming p-n junctions by combining gate electrodes and performed precise measurements of current-fluctuation ("shot noise") in the graphene p-n junction in the QH regime in the strong magnetic fields and at low temperatures. As shown by Figure 1, this group clarified that while shot noise took place in the graphene p-n junction in the QH regime, shot noise did not take place in the absence of the graphene p-n junction. This group also verified that the quantity of the observed shot noise was nearly consistent with theoretical predictions. 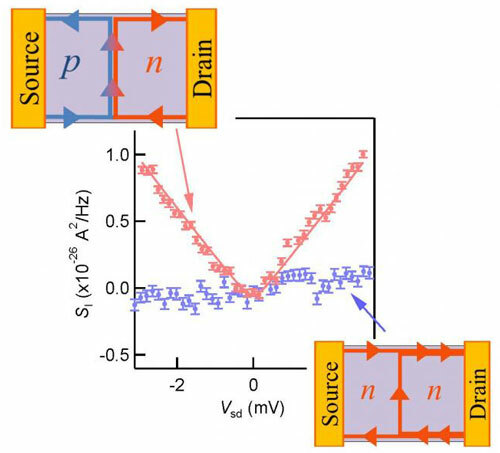 These results directly demonstrated for the first time in the world that electron partitioning took place in the p-n junction in the QH regime, and microscopic characteristics of electron partitioning taking place in the graphene p-n junction were quantitatively established for the first time.